PRESENTATIONS, RECAPS, PHOTOS, AWARD WINNERS - All posted soon! YOGA on the BEACH! Susannah Gillespie, wife of CEAM Member Rob Gillespie (RK&K), offered two FREE Yoga on the Beach Sessions at the 2017 CEAM Fall Conference. 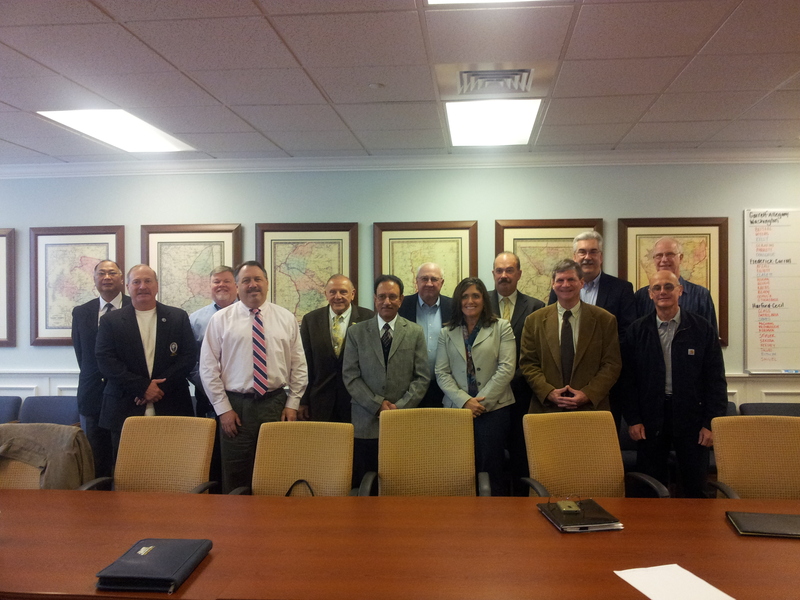 Pictured above are the attendees at Friday's session. First Row (L to R): Susannah Gillespie, Erv Beckert (Prince George's County), George Erichsen (St. Mary's MetCom), and Jessica Shearer (Wallace Montgomery). Second Row (L to R): Sameer Shukla (Sheladia Associates), Julie Barown (Orenco Systems), Rob Gillespie (RK&K), Stephanie Walder (Prince George's County), & Hadi Quaiyum (Prince George's County). Photo Credit: Rob Gillespie. Click on the photo above for a full-sized version. CEAM would like to offer a huge THANK YOU!!! to Susannah Gillespie for providing this great opportunity for conference attendees. PDH Certificates have been e-mailed. Thanks for your patience! Please contact the webmaster with any questions. Those who have requested revisions will be receiving the updates certificates shortly. We always want to improve! Please complete our conference survey HERE! The 2017 CEAM Spring Conference was held on Thursday, May 25, 2017 at the Samuel Riggs Alumni Center at the University of Maryland in College Park. Over 200 attendees enjoyed a full day of presentations and technical sessions designed to share the latest news, trends, practices, and products for local government engineers and consultants. The day began at 8AM with registration and continental breakfast. Conference programming officially got underway at 9AM with the welcoming and opening remarks by 2016-2017 CEAM President W. Scott Flanigan, P.E. President Flanigan (who serves as Director of Public Works for Cecil County) welcomed everyone to the conference, went over a few minor housekeeping items, and previewed some of the sessions on tap for later in the day. The Keynote Address was given by Brad W. Frome from the Office of the County Executive in Prince George's County Government. The first hour of the conference was capped off with a presentation from Barbara Zektick from the Maryland Association of Counties. Ms. Zektick discussed events of Maryland's recently completed legislative session. 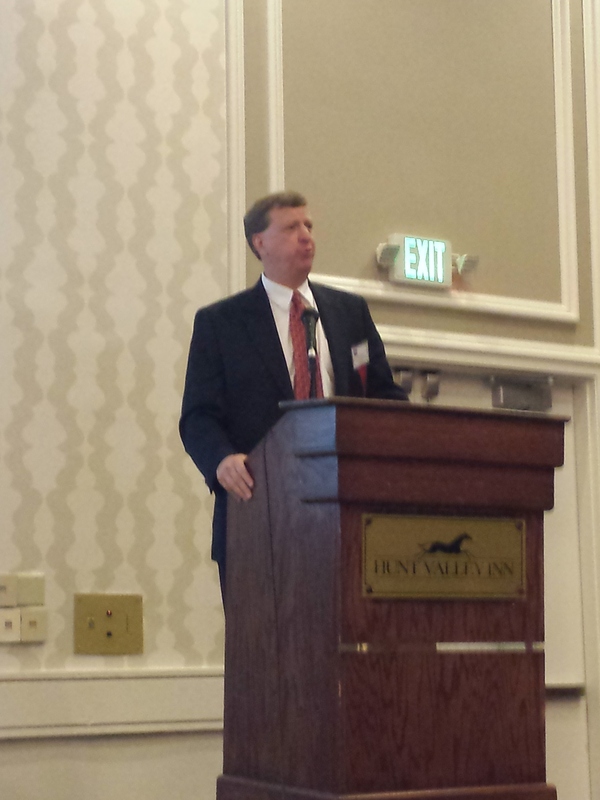 Above: Brad W. Frome, from the Office of the County Executive in Prince George's County, provides the Keynote Address. The first break of the morning was followed by James Johnson of Wallace Montgomery reviewing some ethical considerations paramount in importance for every practicing engineer. The remainder of the morning programming consisted of the installation of new CEAM Officers for the 2017-2018 year as well as the annual CEAM Business Meeting. New Officers for the organization (term effective July 1, 2017 through June 30, 2018) were installed and thanks were given to outgoing officers (those who are ending their term as of June 30, 2017). Above: CEAM President Scott Flanigan administers the Oath to incoming CEAM Officers. From L to R, CEAM President Scott Flanigan, CEAM Secretary J. Michael Warring, Director Tim Cupples, Director Doug Levine, Associate Director Justin Acacio, Director Scott Kearby, 2nd Vice President Danielle Conrow, President-elect Todd Mohn, 1st Vice President Erv Beckert, and Associate Director Mark Bodmann. Below: CEAM President Scott Flanigan (left) describes duties of the elected positions to incoming President Todd Mohn, 1st Vice President Erv Beckert, and 2nd Vice President Danielle Conrow. The CEAM Business Meeting followed. Among other topics of discussion, CEAM President Flanigan made it a point to recognize outgoing CEAM Treasurer Douglas Myers. Treasurer Myers has held the Treasurer position for over 10 years and President Flanigan thanked him for the tremendous amount of time and effort given to this volunteer position over many years. The 2017-2018 CEAM Annual Budget was approved and 17 new members were welcomed into the organization. A delicious lunch consisting of salad, pasta, potatoes, pork, ham, and desserts was provided to all conferencegoers. Afternoon programming commenced with a timely and interesting presentation concerning the status of the Maryland Purple Line Project by Bill Parks and Mike Madden from the Maryland Transit Administration. After that presentation, conference attendees then chose one of two technical sessions to attend over two different hour blocks. In the first technical session window, attendees could choose between Technical Session A: Innovative Materials and Methods in Stormwater Management by Shawn Coombs (ADS) & Matt Griffin (Contech) or Technical Session B: Pavement Preservation & Pavement Repair Innovations by Mike Samueloff (Huesker), Mike Mussog (Pavement Corp.), & Dr. Charles Schwartz (Univ. of MD - Civil Engineering). After a brief break, the day's final session gave attendees an opportunity to choose between Technical Session A: Peer Review Program & Third Party Inspection by Mary Giles, Dan Dornan, Edmund Kalie, and Nawaf Esayed (all of Prince George's County DPIE) or Technical Session B: Pedestrian/Bike Safety Innovations and Applications presented by George Branyan (District Department of Transportation) and Rai Sharma (Calvert County DPW). On behalf of Conference Chairman Erv T. Beckert, P.E. of Prince George's County, thank you to everyone who attended, volunteered, presented, or otherwise contributed to the overall success of the 2017 CEAM Spring Conference. We look forward to welcoming you to Ocean City this fall for the 2017 CEAM Fall Conference from September 20-22. Look for more information soon! 1st Row (L to R): Scott Flanigan (current CEAM President), Todd Mohn, Chuck Weber, Jim Wilson, Hudson Myers, Rai Sharma, Mark DeLuca, Bruce Johnston. 2nd Row (L to R): John Redden, Mike Moulds, Chuck Beall, John Tustin, Ed Plank, Jim Irvin, John Norris. Invitations were mailed to all Past Presidents in the CEAM records. If any of our CEAM Past Presidents did not receive an invitation to this year (and would like to in the future), please contact us so your address can be verified. Contact Peter Daloni for more information or visit the website. Thank you for attending the 2016 CEAM Spring Conference at the Conference Center at the Maritime Institute of Technology. 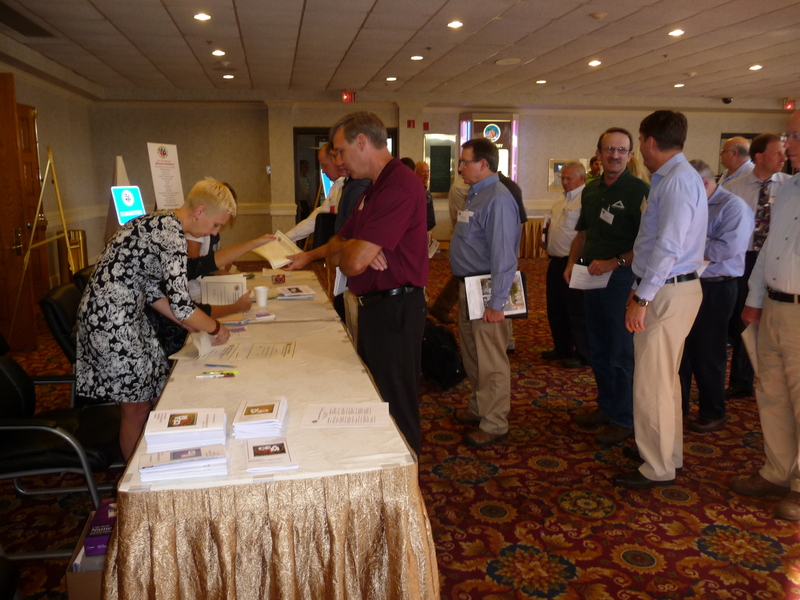 Approximately 250 individuals enjoyed a full day of technical presentations, networking, and fellowship. The Conference Center at the Maritime Institute of Technology (CCMIT) served as host for the 2016 CEAM Spring Conference. Conference Chairman Christine Romans and her staff from Anne Arundel County welcomed attendees with envelopes full of information for the day. The registration packet included a facility map, CEAM pen, CEAM notepad, agenda, and notices about the 2016 CEAM Fall Conference. Upon checking in, attendees were able to enjoy a continental breakfast and catch up with colleagues and friends within the CEAM organization. 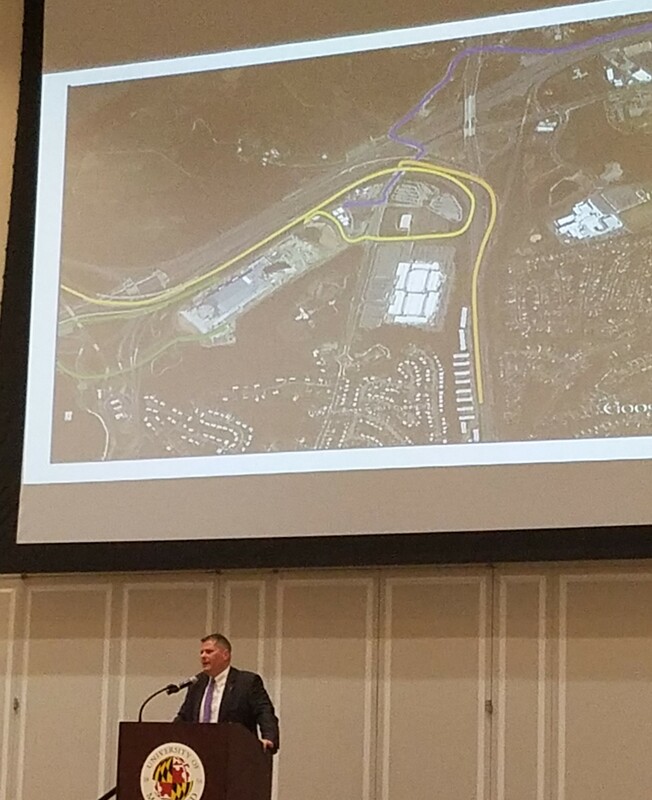 CEAM President Mark DeLuca (Howard County) offered opening remarks and then introduced the day's Keynote Speaker, Mr. Greg Johnson, P.E., Administrator, Maryland State Highway Administration. Mr. Johnson provided some updates on initiatives he's been exploring since being appointed as Administrator in 2015. MACo Executive Director Michael Sanderson provided an engaging and concise recap of the 2016 Maryland Legislative Session. 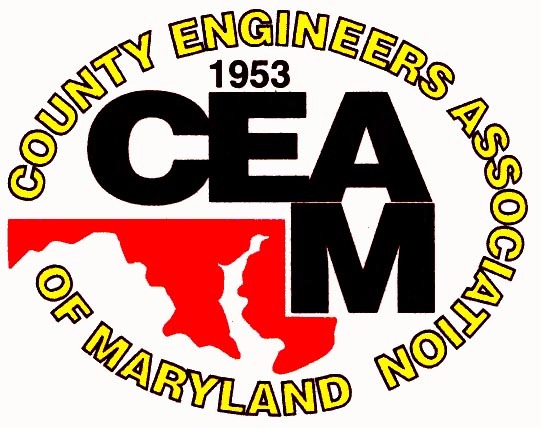 CEAM serves an affiliate to the MACo organization and in 2016 CEAM provided MACo with information on several pieces of proposed legislation as it may pertain to potential impacts on county government public works operations. Following a short break, Mr. Paul Shank, P.E. (Maryland Aviation Administration) provided a detailed look at some of the many initiatives currently underway at Baltimore-Washington International Thurgood Marshall Airport. Mr. Shank gave details of the difficulties associated with construction projects in an active and busy airport. Immediately preceding lunch was the CEAM General Membership/Business Meeting. Officers for the 2016-2017 Year (effective July 1, 2016) were introduced and installed by CEAM President Mark DeLuca. Outgoing President DeLuca and incoming President Scott Flanigan offered brief remarks. For a full list of incoming officers, please check the Officers page later this summer when the new term begins. Buffet-style lunch with many different options was provided in the CCMIT Dining Hall. Afternoon sessions at the Conference began with SHA Deputy Adminstrator Dave Coyne providing an update on the Maryland State Highway Administrator Access Management program. Technical sessions were next and attendees had an opportunity to choose between sessions on bridge replacement, nutrient trading, force main assessment, and stream restoration. The last technical session ended at 4:15PM and closed out another CEAM Spring Conference. Many thanks to all our attendees. Thanks to Conference Chairman Christine Romans from Anne Arundel County and all her staff for putting together a terrific conference. Because of their hard work assembling the agenda, attendees will be able to earn up to 5.5 PDH for attending sessions throughout the day. Photos from throughout the day as well as links to presentations will be posted in the near future. 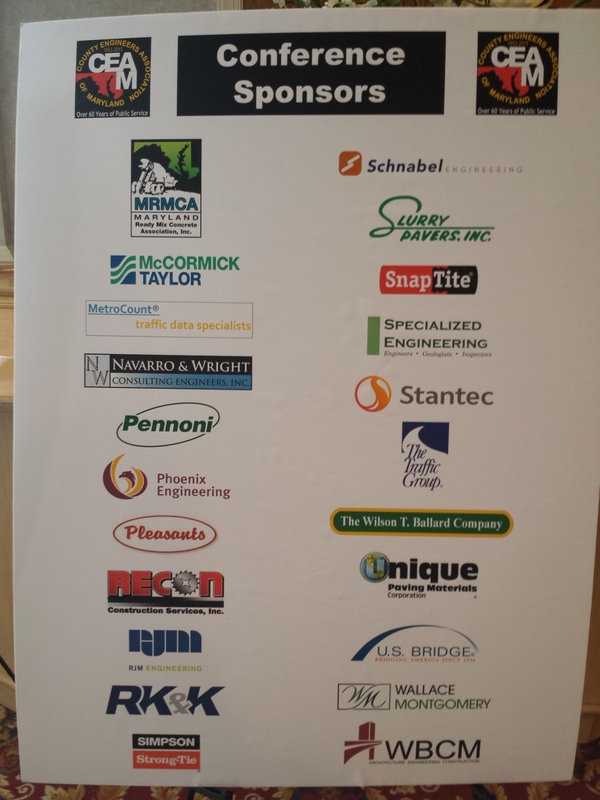 Thanks to all the sponsors and attendees! Please e-mail the webmaster any comments or suggestions for future conferences. Thank you again for your attendance. The 2015 CEAM Fall Conference was held September 23-26, 2015 at the Clarion Resort Fontainebleau Hotel in Ocean City, Maryland. 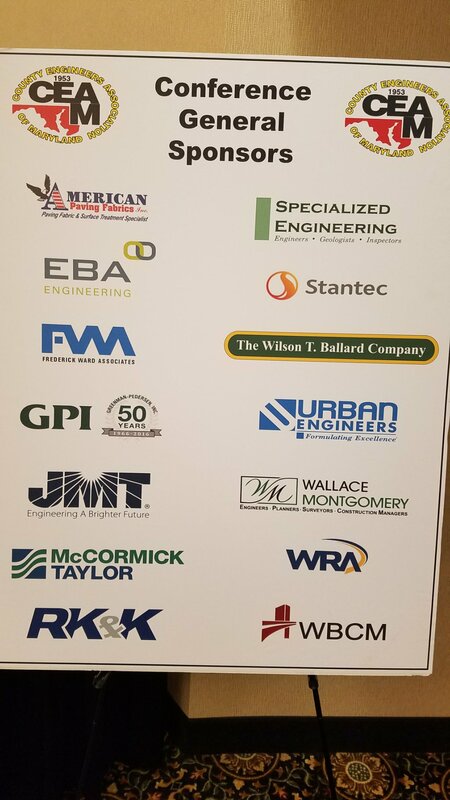 Over 230 individuals attended the event to learn the latest news, trends, and events regarding civil engineering around the State of Maryland and beyond. Conference attendees were treated to several notable speakers and presentations and had the opportunity to earn professional development hours (PDH) for continuing education requirements. As usual, conference attendees enjoyed fine food and fellowship in addition to the conference programming. Approximately 70 golfers kicked off the conference on Wednesday afternoon with the Roger H. Willard Scholarship Fund Golf Tournament at The Bay Club. Later that evening, CEAM replaced the traditional Friday Deck Party with a Wednesday Evening Opening Mixer/Reception. This event was very well attended and allowed those traveling from far away a chance to relax and catch up with colleagues and friends prior to the beginning of the conference in earnest on Thursday morning. Thursday and Friday contained traditional conference programming. Head to the Presentations page to download or review the slides from your favorite presentation or from any you may have missed. Keynote Speaker MDE Secretary Ben Grumbles addresses the conference on Thursday morning. Jon Capacasa, Water Division Director, EPA Region III, updates CEAM on the status of the Chesapeake Bay TMDL. Thursday evening was the traditional Seafood Feast in the resort's Crystal Ballroom. After enjoying a feast of crab legs, oysters, and more, the 2015 CEAM Awards Program began. After presenting project awards earlier in the day, CEAM Awards Chairman Matt Allen presented a host of individual awards at the Seafood Feast. Please visit our Awards page for in depth information about our award-winning projects and individuals for 2015. Thursday night Seafood Feast & Banquet. Thanks to all conference attendees for helping CEAM stage another successful conference! FINAL AGENDA Use this for PDH purposes! Click on a sponsor board below for a full-size version of each photo (opens in separate window). Presentations now available! Visit the CEAM Presentations page! 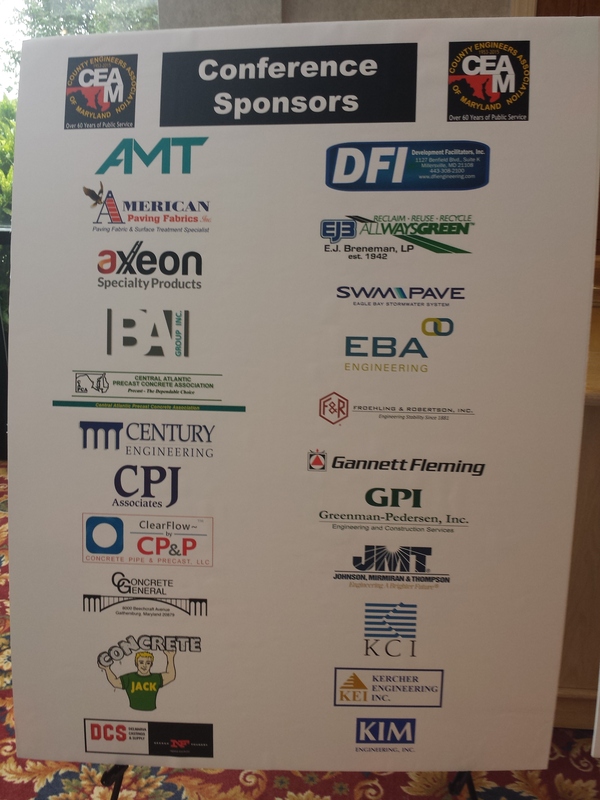 HUNT VALLEY, MD - Approximately 170 individuals gathered together at the Hunt Valley Inn on Thursday, May 14 to network, earn PDHs, and learn about current engineering projects and practices from across the State of Maryland and beyond. Public sector employees were represented from as far west as Oakland in Garrett County to as far east as Ocean City in Worcester County. Private sector employees came through in a big way by generous sponsorships for both the general conference and the Golf Tournament. The morning began with a continental breakfast and networking. CEAM 2015 Spring Conference Chairman (& 2nd Vice President) Scott Flanigan (Director of Public Works for Cecil County) opened the Conference by welcoming the attendees and discussing the planned events for the day. CEAM President Michael S. Moulds (City of Salisbury) followed with some welcoming remarks. Then, keeping with tradition, Maryland Association of Counties (MACo) Legislative Director Andrea Mansfield gave an overview of the recently-completed 2015 Legislative Session of the Maryland General Assembly. Her presentation will be available on the CEAM website very soon. The CEAM Annual Business Meeting followed. 17 of 24 member jurisdictions were represented at today's meeting. During the meeting, President Moulds introduced the incoming Board of Directors set to take office on July 1, 2016. Associate Directors on the Board of Directors will be Joshua Dupee (Century Engineering - 1st Term) & Charles Nolan (Greenman-Pedersen - 2nd Term). Regular member Directors will be Erv T. Beckert (Prince George's County - 1st Term), Robert Shen (Frederick County - 1st Term), Deborah Butler (Carroll County - 2nd Term), George Erichsen (St. Mary's County - 2nd Term), and John Redden (Wicomico County - 2nd Term). Incoming CEAM 2nd Vice President will be Christine Romans from Anne Arundel County. Incoming CEAM 1st Vice President will be Scott Flanigan from Cecil County. The incoming CEAM President for 2015-2016 will be Mark DeLuca from Howard County. 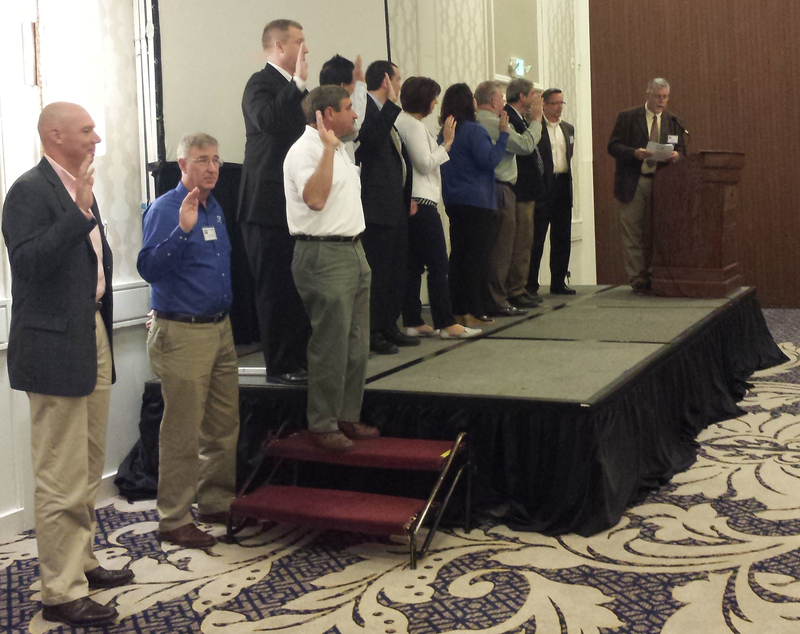 Incoming members of the Board of Directors take the Oath of Office from CEAM 2014-2015 President Mike Moulds. 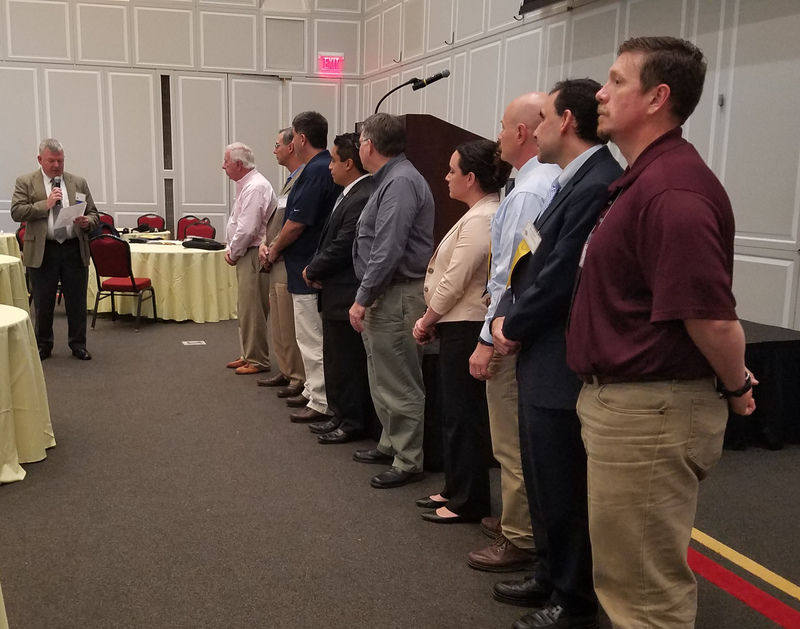 Those incoming BOD members present at today's meeting were brought before the general membership to take the Oath of Office administered by President Moulds. Incoming President DeLuca was presented with a personalized gavel from President Moulds to use during his tenure as President. DeLuca offered brief remarks before Immediate Past President Bruce E. Johnston (Montgomery County) presented outgoing President Moulds with a plaque commemorating his past year as President of CEAM. Dave Coyne, P.E. (SHA) provides the Keynote address. The Keynote address for the 2015 Spring Conference was given by Dave Coyne, P.E. - SHA Deputy Administrator/Chief Engineer for Operations. Technical sessions were presented for the remainder of the day. Any presentations will be posted on the website as they are made available to CEAM. A follow-up survey will be distributed soon to all attendees. Please provide any suggestions or recommendations on how we can continue to improve our conferences. Receipts are generated for PayPal payments, but not for registration confirmation. If possible, this feature will be added for the Fall. Members in good standing will have the option to submit a headshot for publication in the online membership directory. Printed directories will remain in the same format, but digital copies can be updated more frequently for a fraction of the cost. All attendees in need of PDH certificates should have received them at the conference from the Cecil County staff at the registration table. If you have any questions regarding PDHs for this conference or if there are any problems with your certificates, please contact the Conference Chairman for assistance. AGENDA - FINAL VERSION Available! Use this as official record of the conference and speakers/titles for PDH audit purposes. Payment processing will be completed as soon as possible. If you have any questions about the status of your payment, please e-mail CEAM and we will respond ASAP. Pictured (click for larger version) (L-R): Front Row - Todd Mohn ('02), Edgar Gonzalez ('03), Gerald Cichy ('84), Jim Wilson ('07), Hudson Myers ('11), Ed Adams, Jr. ('04), Jim Irvin ('89), John Redden, Jr. ('08). Back Row - Greg Africa ('09), Bruce Johnston ('13), Paul Kahl ('12), John Norris, Jr. ('79), Steve Young ('86), Melvin "Chuck" Beall, Jr. ('00), John Tustin ('06). The 2014 CEAM Past Presidents Luncheon was held on Thursday, December 4, 2014 at the MACo Office Building in Annapolis, MD. This annual event is held in conjunction with the December CEAM Board of Directors Meeting and offers past CEAM Presidents the opportunity to gather with their peers to recount CEAM memories as well as learn about current happenings. This year, meeting attendees were treated with a Legislative Update from MACo Legislative Director Andrea Mansfield and MACo Legal & Policy Counsel Les Knapp. After the meeting, a crabcake luncheon (catered by Graul's Market in Annapolis) was served and enjoyed by all. The 2013 Past Presidents' Luncheon was held on Thursday, December 5, 2013 at the MACo Building in Annapolis. Following the regular CEAM Board of Directors Meeting, all Board Members and Past Presidents were treated to a delicious crab cake lunch. The intent of the Past Presidents' Luncheon is to bring together all former Board Presidents to relive memories of CEAM events in the past. The reunion also helps provide perspective on current events by allowing former Presidents to offer any insight/advice on issues currently going on in CEAM and around the State of Maryland. For the 2013 Luncheon, CEAM was pleased and honored to welcome SHA Administrator Mrs. Melinda Peters as the Keynote Speaker. Mrs. Peters gave a thorough and comprehensive update on highway- and transportation-related issues and provided a possible forecast of how these issues may play out in the upcoming legislative session. BOD members and Past Presidents also enjoyed an opportunity for some back-and-forth dialogue and questions with Mrs. Peters. First Row (L-R): Ed Plank '10, Jim Wilson '07, P. Rai Sharma '01, Melinda Peters (SHA Administrator), Hudson Myers '11, Charles Weber, Jr. '97; Second Row (L-R): Greg Africa '09, John Redden '08, Gerald Cichy '84, John Norris, Jr. '79, Jim Irvin '89, Melvin "Chuck" Beall, Jr. '00, Steve Young '85. CEAM has received the following notices from Tanya Emam at FHWA. Ms. Emam is the Program Management Analyst & EDC Coordinator for the FHWA-DelMar & DC Divisions. Please contact her if you have questions. She may be reached via e-mail at tanya.emam@dot.gov or via phone at 302-734-5324. Request for comments on new Accelerated Innovation Deployment (AID) Demonstration program-- November 22, 2013 deadline! An interim Notice of Funding Availability (NOFA) and request for comments for a new innovation demonstration grant program is published in the Federal Register (Docket No. FHWA-2013-0048). This notice announces the availability of $15 million in funding authorized within the Technology and Innovation Deployment Program (TIDP) under MAP-21. The notice begins a 21-day comment period on the proposed application process, eligibility requirements, and criteria FHWA will use to select projects for funding. This demonstration funding could be used for innovations within projects eligible for assistance under title 23, United States Code in all aspects of highway transportation including planning, financing, operation, structures, materials, pavements, environment, and construction. This program may be of interest as a possible resource to implement innovations included in the Every Day Counts (EDC) initiative (http://www.fhwa.dot.gov/everydaycounts/). Please share this notice with your partners (https://federalregister.gov/a/2013-26053), encourage them to pre-register for the planned webinar (https://connectdot.connectsolutions.com/tidp/event/), and remind them to submit comments on this interim NOFA (http://www.regulations.gov). For more information, please contact Ewa Flom, ewa.flom@dot.gov or 202-366-2169. Thank you for your attendance at the 2013 CEAM Fall Conference. We enjoyed beautiful weather and a great turnout. Submit your feedback on this year's conference - take the survey! COMING SOON. Check out the Presentations page for downloads from the 2013 Fall Conference. Check out the Awards page for the 2013 Awards Program winners. CEAM 60th Anniversary Presentation - Download Here (136 MB - LARGE FILE). See below for photos from the 2013 Fall Conference - COMING SOON. Thanks to CEAM Historian Matt Allen and past Historian Jim Montgomery for their photos and assistance with our media efforts. CEAM 2013 Spring Conference - Success! The 2013 Spring Conference was enjoyed by nearly 200 attendees at the beautiful Samuel Riggs Alumni Center on the University of Maryland College Park campus. Photos and recaps of the day's many presentations to follow! 2013-2014 CEAM Board of Directors (terms to begin July 1, 2013) are pictured after taking the CEAM Oath and being officially installed. Back Row (L-R): Paul Kahl, Allegany County, 2012-2013 CEAM President; Mike Moulds, Dorchester County, 1st Vice President; Ray Clarke, Talbot County, Director (1st Term); Tim Connor, Gannett Fleming, Associate Director (2nd Term); Middle Row (L-R): Mark DeLuca, Howard County, 2nd Vice President; Scott Flanigan, Cecil County, Director (2nd Term); Jennifer Smith, Washington County, Director (2nd Term); Rob Marchetti, McCormick Taylor, Associate Director (1st Term); Bruce Johnston, Montgomery County, 2013-2014 CEAM President; Front Row (L-R): Mary Giles, Prince George's County, Director (1st Term), Christine Romans, Anne Arundel County, Director (2nd Term); Doug Myers, MD Environmental Service, Treasurer. Not Present: J. Michael Warring, American Paving Fabrics, Secretary; Matthew Allen, Wallace Montgomery, Historian. In honor of our 60th Anniversary, CEAM has updated its logo and is planning a series of commemorative events at both the Spring and Fall Conferences. Click on the new logo below to learn more about our 60th Anniversary preparations! Please verify your membership status when paying dues for 2013. The various membership types are described below. If you are unsure about your current membership type or wish to join and don't know which type is right for you, please e-mail the webmaster. 2013 Dues - Online Payment Now Available! CEAM has added the option to pay for your 2013 dues online via PayPal transaction (no PayPal account required). Please utilize this function instead of sending/faxing the traditional paper credit card renewal form. Please click here to Pay Your Dues! Member status - Granted to all County, Municipal, State, or Federal Government employees. Associate Member status - Granted to any private corporation or organization representative, including engineering consultants, contractors, and vendors. Retired membership status - Granted to all of our former members and associated members who still maintain an active interest in CEAM and the profession. Memberships are for individuals only, not entire organizations. Annual dues for full members are $25 per year and $45 per year for associate members. Retired members dues are $5 per year. Dues renewal notices are being sent via e-mail this year and will request a complete update of all member information. Please do your part to help us accurately update our records! CEAM Board of Directors member Scott Flanigan recently caught up with CEAM. Check out the latest edition of our new feature by going to the Catchin' Up With...Q&A page. CEAM wishes to extend condolences to the family of John Armacost, 89, who died on Sunday, January 14, 2013. Mr. Armacost worked for the State Roads Commission which later became the Maryland State Highway Administration. Additionally, he served as Director of Public Works for Carroll County and then County Commissioner. He was a retired member of CEAM and had served as Treasurer in the past. Mr. Armacost was respected and admired by his colleagues and friends in CEAM and will be remembered for his great personality. Mr. Armacost's obituary notice can be accessed via the following link. 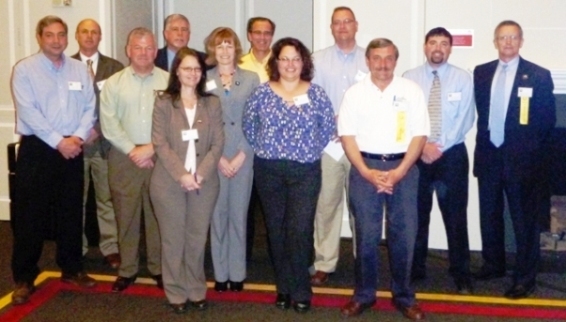 The 2012 Past Presidents Luncheon was held on December 6, 2012 following the regular CEAM Board of Directors Meeting. Attending the lunch were as follows: 1st Row (L-R) Gary Rohrer, Edgar Gonzalez, James Wilson, Rai Sharma, Gerry Cichy, Charles Weber, John Redden, Ed Adams; 2nd Row (L-R) Joe Kroboth, Jim Markle, Jim Irvin, Greg Africa, John Tustin, Ed Plank, Steve Young, Chuck Beall, Hudson Myers. Click on the photo for an enlarged version. Recap and photos available in the October 5 CEAM Update (see above)! CEAM gets some press from NACE! James D. Wilson, our NACE (National Association of County Engineers) Representative, recently submitted a recap of our 2012 Spring Conference for the June 2012 NACE Newsletter. Thanks to James for his recap and for garnering some attention for our organization in a national publication. To read the newsletter, click here. For more about NACE, visit their website.